The Mighty Mo was brought to us by the Ideal Toy Company which was founded as Ideal Novelty and Toy Company in New York in 1907 by Morris and Rose Michtom after they had invented the Teddy bear in 1903. The company changed its name to Ideal Toy Company in 1938. In 1982, the company was sold to CBS Toy Company, which in turn sold Ideal to Viewmaster International in 1987, which renamed itself to View-Master Ideal in the process. View-Master Ideal was later bought by Tyco Toys, Inc. of Mt. Laurel, New Jersey, upon its purchase of View-Master Ideal. 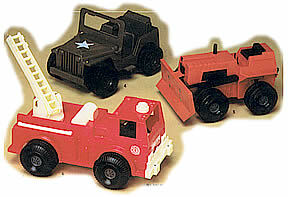 The Ideal line remained part of Tyco until Tyco’s merger with Mattel, Inc., in 1997.